By Mary Daire|2019-03-15T12:43:41-04:00March 15th, 2019|Categories: Grade 1-2, Grade 4, Grade 5, Grade 6, Grade 7, Grade 8, Kindergarten|Comments Off on Mois de la Francophonie in full swing at BCD! By Mary Daire|2019-01-24T13:51:08-04:00January 24th, 2019|Categories: Grade 4, Grade 5, Grade 6, Grade 7, Grade 8|Comments Off on Mois de la Francophonie, How Will We Celebrate at BCD? Bonjour et bienvenue to the 2018-2019 school year! Over the summer, I spent time preparing materials for the new year. I tapped into new resource providers, like the publisher Bayard-Milan, and I am looking forward to implementing new resources in partnership with what is currently in circulation for native-speaking students in France. I’ve built on my visit last Spring to the International School of Boston (ISB), a bilingual French-American school, have reviewed my notes, and am bringing new ideas into play this year throughout the various grade levels here at BCD. While visiting ISB, I spent the day shadowing French teachers in different grade levels, 1st through 5th, to get a firsthand account of a day in the life of a French immersion school. Reading in the target foreign language is a pillar in strengthening a student’s aptitude and comprehension. In French class at BCD, I will continue to include French stories and French language educational magazines into daily classwork, which will encourage the students to learn about themselves, the world around them, and about expressing their unique personality … in French! Improve and strengthen existing French tracks. On a gagné! We won! When I arrived on campus last Friday, I found four big cardboard boxes full of brand new French books for BCD! 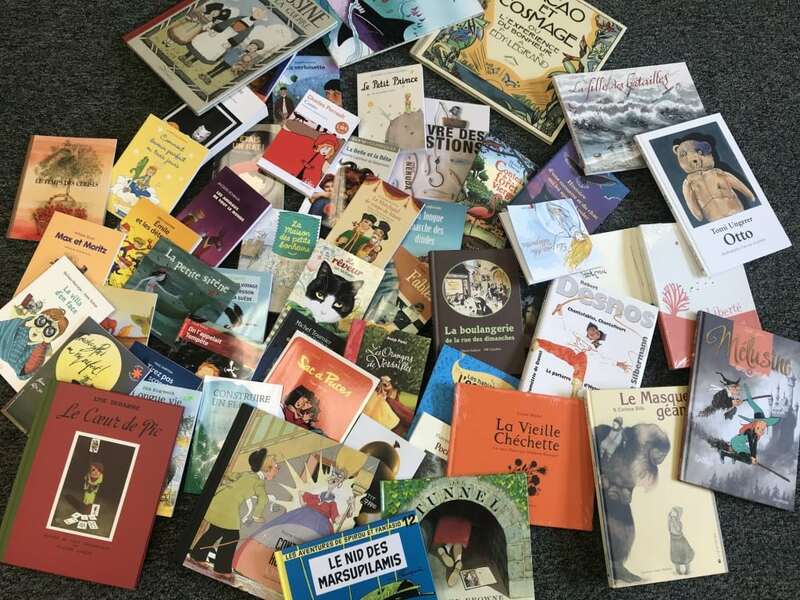 These 70 books will contribute greatly to our school’s French-language literature resources which will be used in French class across the grade levels. I also encourage students and parents to borrow books as often as they’d like to read at home. The different resources and the experiences I refer to in this post, combined with the enriching, culturally appropriate, and level-appropriate novels and multimedia tools we currently use in my curriculum, will help enable the continued discovery and encouragement toward the enjoyment of literature in French at BCD. I hope that you have all had a fun summer! I, along with my colleagues, are so happy to welcome you back to the BCD campus this week, or to campus for the first time if you are a new student and family! Here’s to a great year! By Mary Daire|2018-09-06T11:58:56-04:00September 4th, 2018|Categories: Grade 1-2, Grade 3, Grade 4, Grade 5, Grade 6, Grade 7, Grade 8, Kindergarten|Comments Off on Always Enhancing French Classes—And a Win!